Nevertheless, Rafael Nadal leads the H2H 10-3 (5-2 on clay), and he will start as the overwhelming favorite but Fabio Fognini, playing to his maximum potential, has an excellent chance of becoming only the second player to beat Nadal on clay in the last 16 months (Thiem in Rome 2017 and Madrid 2018). Top seed Rafael Nadal produces yet another dominant performance to defeat the Canadian teenager Denis Shapovalov in the round of 16 at the Rome Masters on Thursday, 6-4 6-1. Apart from losing to Thiem in Madrid last week and winning the second set 7-5 against Klizan in Barcelona, the Spaniard did not lose more than four games in a set in any of his matches on clay this season (w/l on clay- 16/1). Rafael Nadal is now at the stage where he failed in the last three seasons, to three different opponents, Stan Wawrinka in 2015, Novak Djokovic in 2016 and Dominic Thiem in 2017. None of these three players who defeated Nadal in the quarterfinal could win the Rome Masters title that year. Moreover, the world #2 suffered a disappointing quarterfinal defeat against Dominic Thiem in the Madrid Masters last week, and he will be hoping to avoid another quarterfinal exit in Rome this week. Failure to defend the title in Madrid has done enough damage to Rafael Nadal. He lost the #1 spot to Roger Federer, 21-match winning streak on clay, as well as the 14-match winning run, has ended. More importantly, the sense of invincibility was taken away from him as he looked unbeatable until he met Thiem last week. The seven-time champion of Rome, Rafael Nadal, is yet to win a title here since lifting them for two consecutive years in 2012 and 2013, by defeating Novak Djokovic and Roger Federer in the final, respectively. After defeating the 2018 Madrid Masters runner-up Dominic Thiem in three sets during their second-round encounter, Fabio Fognini made a slow start to his third round match but recovered well in time to secure the progression in straight sets, 6-4 6-4. With the win against Thiem, Fabio Fognini recorded his career-best result in this tournament. Despite entering the Rome masters every year since 2005 (except for 2008), the Italian could not progress beyond the round of 16 even once. Though Fognini has made a slow start to the European clay swing, he managed to post some impressive results during the South American clay swing earlier this season, such as winning the title in Sao Paulo and reaching the semifinal at Rio de Janeiro. 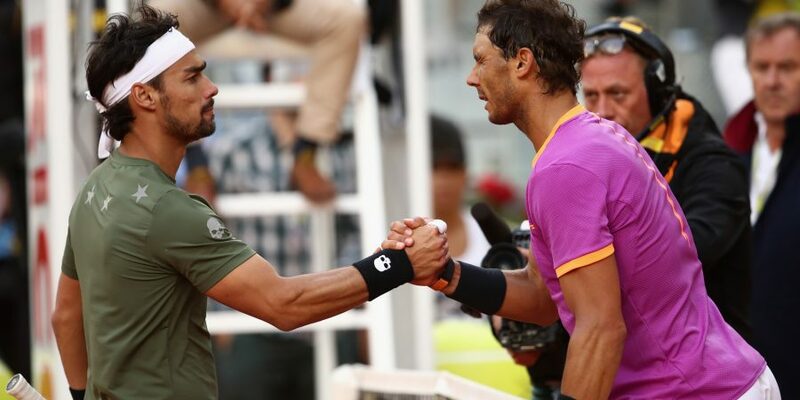 Very few players have beaten Rafael Nadal more than once on clay, and Fabio Fognini is one of them, having registered wins over Nadal in Barcelona 2015 and Rio de Janeiro 2015.